Novelcamp.net is an adware application that continually spams users' browsers with pop-up ads, redirects, displays sponsored links, and initiates other unwanted activity on the targeted computer. The infection of adware typically occurs when users download shareware or freeware from the internet, and not notice the optional offers that generally are disguised. After the infiltration, Novelcamp.net might modify the settings Google Chrome, Internet Explorer, Mozilla Firefox, Safari in order to perform its suspicious activity. Furthermore, once redirected to the site which pretends to be a database for online novels, users will be exposed to countless ads, which might be unsafe on itself. 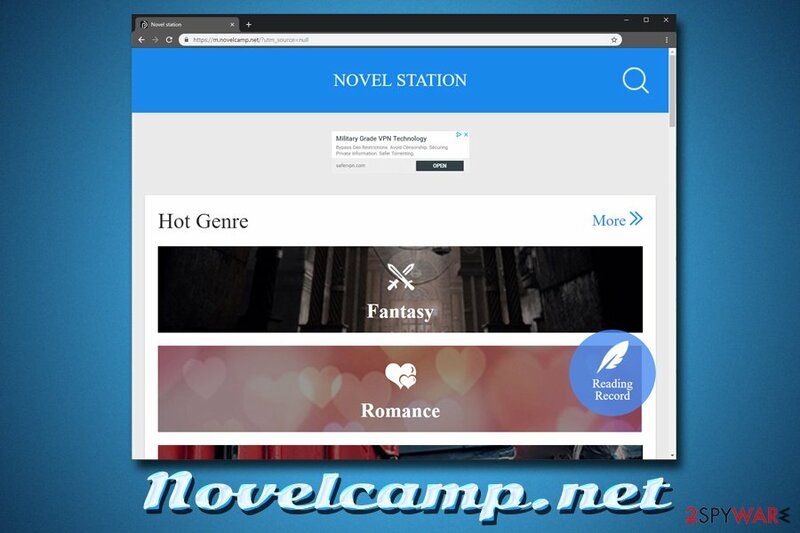 Therefore, in case you can not get rid of m.novelcamp.net pop-ups on Windows or Android device, you should check out this article. Symptoms Intrusive ads, pop-ups, redirects, etc. Because the potentially unwanted application usually is installed stealthy, users are often baffled where all these annoying redirects and pop-up ads come from. Due to this, they often refer to the activity as Novelcamp.net virus, although it is not necessarily malware, as the host site is safe (it is even verified by Amazon valid certificate). However, adware and other PUPs can expose users to online dangers that otherwise would not be present. While the internet safety and security was drastically improved over the years, it is still not that secure of a place, and viruses can be lurking anywhere – especially if Novelcamp.net or similar adware is present on the machine. For that reason, Novelcamp.net removal should be performed to secure the device to avoid malware infections or such consequences like data leak. As a general rule, potentially unwanted programs collect web browsing details from users for monetizing purposes. Evidently, all the accumulated data might be misused and end up in the hands of bad actors. In some cases, it might be not that easy to remove Novelcamp.net pop-ups and other unwanted activity. This is because it can be associated with any adware program installed on the device. Some most aggressive types of adware don't even have an entry in a Control Panel or Apps installed folder. For that reason, we recommend scanning the PC with security software that specializes in PUP detection and removal, although manual elimination should not hard to perform if the unwanted app is found easily. Additionally, experts recommend using Reimage to recover from adware infection. As we already mentioned, adware application usually enters without much warning, so users are often surprised where are all those pop-ups, redirects and other unwanted activity is coming from. The answer is simple: those infected should check the applications they have recently installed. Installers, especially those which come from third-parties, often bundle additional applications for monetization purposes. Unfortunately, users are then stuck with infected browsers which often redirect them to unwanted websites, block the content of legitimate sites and spawn multiple banners, pop-up windows, etc. Additionally, those who interact with the intrusive elements might expose themselves to malware infection or even personal data theft. For that reason, don't get tricked by freeware developers. You should pick a reliable source for software downloads and avoid such programs like driver updaters, registry cleaners, compressors, file converters and similar. Do not stuff your PC with useless applications – not only will it slow down your device but you are more likely to have adware installed. When dealing with the installation wizard, pay attention to each step. Developers often hide the optional elements under pre-ticked boxes, grayed out buttons, and similar tricks. Additionally, picking Advanced or Custom installation settings is mandatory, as this will ensure the installation of only desired software. To remove Novelcamp.net virus from your device, you will have to perform several steps. First of all, you should try identifying the unwanted app yourself, as per our instructions below. However, sometimes it might be hard to determine which application is the culprit, especially if you have plenty installed on your PC. For that reason, we suggest you try Novelcamp.net removal with the help of security software that specializes in PUP detection since most anti-virus engines focus on more severe infections like ransomware of trojans. Once you complete Novelcamp.net adware elimination, you should reset each of the installed browsers to make sure the altered settings do not initiate more unwanted activity after the threat is gone. TIP: never install apps from third-party sites or apps that ask for Admin privileges. Here, look for Novelcamp.net or any other recently installed suspicious programs. Wait until you see Applications folder and look for Novelcamp.net or any other suspicious programs on it. Now right click on every of such entries and select Move to Trash. When in the new window, check Delete personal settings and select Reset again to complete Novelcamp.net removal. Once these steps are finished, Novelcamp.net should be removed from your Microsoft Edge browser. Here, select Novelcamp.net and other questionable plugins. Click Remove to delete these entries. Now you will see Reset Firefox to its default state message with Reset Firefox button. Click this button for several times and complete Novelcamp.net removal. Here, select Novelcamp.net and other malicious plugins and select trash icon to delete these entries. Click Reset to confirm this action and complete Novelcamp.net removal. Here, select Extensions and look for Novelcamp.net or other suspicious entries. Click on the Uninstall button to get rid each of them. Now you will see a detailed dialog window filled with reset options. All of those options are usually checked, but you can specify which of them you want to reset. Click the Reset button to complete Novelcamp.net removal process. ^ SSL Checker. SSLShopper. SSL Comparison charts and reviews. ^ Viruset. Viruset. Cybersecurity news and articles. This entry was posted on 2019-02-14 at 04:51 and is filed under Adware, Viruses. You can quickly scan the QR code with your mobile device and have Novelcamp.net manual removal instructions right in your pocket. How did you remove Novelcamp.net?